Cystic Fibrosis (CF) is an autosomal recessive, life-threating disorder caused by mutations in the gene which encodes cystic fibrosis transmembrane conductance regulator (CFTR) protein. More than 1500 CF causing mutations have been identified, but only the functional importance of a subset of the mutations is known. This is in part due to the rarity of some of the CF mutations and lack of physiologically relevant models to study these mutations. Using CRISPR-Cas9 genome editing, we are editing the endogenous genome of non-CF primary human bronchial epithelial cells (HBECs), exchanging their wild-type CFTR gene with a mutant CFTR gene. 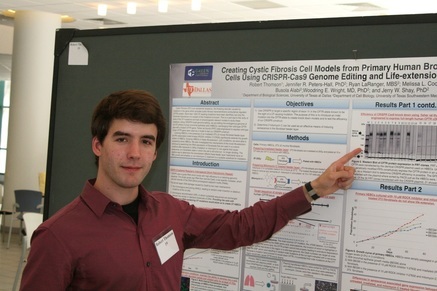 Fisher rat thyroid (FRT) cells engineered to express wild-type human CFTR gene were used as a model to test our CRISPR construct. ​Culturing HBECs in the presence of an irradiated 3T3 J2 mouse fibroblast feeder layer and Rho-associated coiled kinase (ROCK) inhibitor (Y-27632) significantly extends the growth duration of HBECs. Growing HBECs in these life-extension (LE) conditions, we were able to successfully clone HBECs. We also investigated the mechanisms of the novel life-extension technique by examining the RNA expression of fibroblasts that are used in co-culture conditions after exposure to 30Gy irradiation or mitomycin C, two agents that cause senescence, an irreversible state in which the cell is still alive but no longer dividing. The objective was to determine the downstream effects these feeder layer treatments have on HBEC growth and whether or not mitomycin C treatment is a suitable substitute for irradiation. ​Before the Green Fellowship, I had not worked in a research lab. It was a little difficult dealing with the learning curve, but everyone in my lab understood that I was an undergraduate in unfamiliar territory. They eased me into the lab routine at a comfortable pace. The overall experience was very enjoyable. 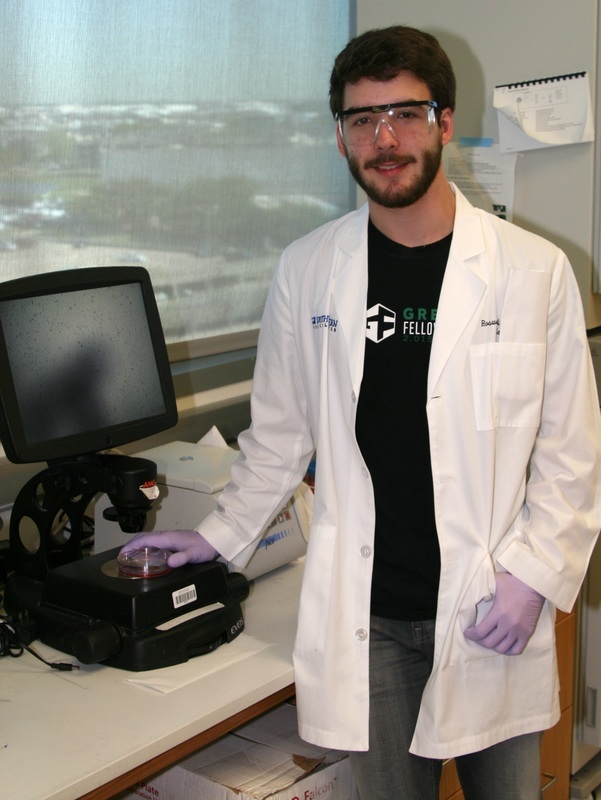 I learned a lot and got plenty of first-hand experience working with cell cultures. Research definitely has its ups and downs. It was frustrating having to troubleshoot experiments for weeks at a time with little success, not to mention the occasional mistake. Pushing through the frustration, whenever things eventually work out, it all becomes worth it and ultimately fulfilling. My Green Fellowship experience was amazing and I really enjoyed it. ​The first step to having an enjoyable Green Fellow experience is getting into the right lab for you. Look up the labs on the UTSW website and read the papers they published to find the lab with the work that interests you the most. Do not be afraid to ask Green Fellow advisors and previous Green Fellows which labs they recommend. Once you get into the lab, taking the proper steps to plan out your experiments is crucial. Without sitting down and writing out the steps you will take in an experiment, mistakes will inevitably occur. I also would recommend going to as many of the lectures and seminars held throughout campus as you can, especially the ones that relate to the work being done in your lab. The lectures might not make much sense at first and a lot of it will go over your head, but as time goes one, you will find yourself understanding more and more of what they are talking about. Keep in mind that your mentors and other researchers in your lab are there because they love science. They are incredibly intelligent and are most likely willing to talk about science or answer any questions you have. Lastly, get to know the other Green Fellows. The labs at UTSW can be surprisingly different from each other, so talking with the other Green Fellows, you can get a broader understanding of how academic research works. Keep in mind that your mentors and other researchers in your lab are there because they love science. They are incredibly intelligent and are most likely willing to talk about science or answer any questions you have. Pushing through the frustration, whenever things eventually work out, it all becomes worth it and ultimately fulfilling.